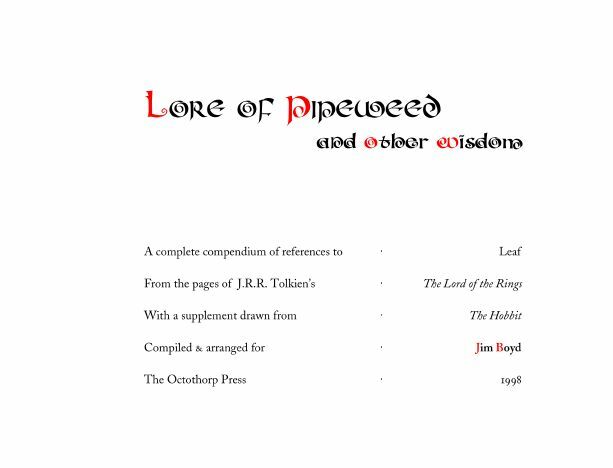 For Christmas 1998, we published a compedium of all references to "Leaf" (or pipe tobacco) in J.R.R. Tolkien's The Lord of the Rings and The Hobbit as a gift for Jim Boyd. The edition of one (plus a complete printer's proof) was ink-jet printed on 25% cotton, acid-free Strathmore Writing paper, velobound with terracotta Hammermill Via covers, and deckle-edged by hand. We trust Houghton Mifflin won't sue us for so small an excerpt published here.